Good thing Montreal is six hours behind Paris because he also has to be here November 19 (yes, the SAME day) for the Santa Claus Parade on St-Catherine Street. If he has to go through customs, he'll never make it. For one thing, the reindeer would have to go into quarantine for who knows how long. 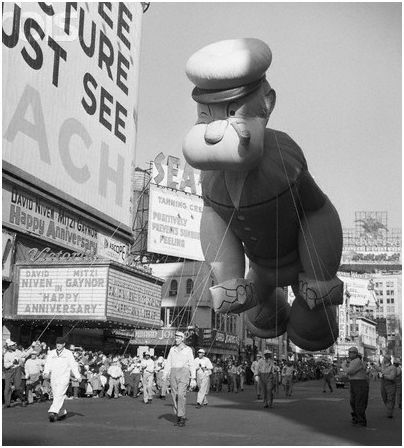 Then, he travels to New York for the Macy’s Thanksgiving Day Parade on November 24. 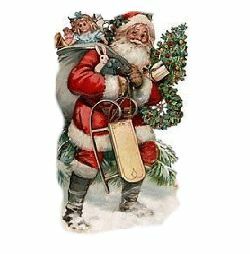 Montreal to New York by sleigh takes no time at all so it’s easy peasy for him. I’d LOVE to see this parade live. I don’t like the television coverage as they pop back and forth from the parade to various acts and places like Hawaii (it may be a beautiful place but not my idea of Christmas). All I want to see is New York and those humungous balloons. I wonder why Macy’s doesn’t call it a Christmas parade? Santa is there, the bands are playing Christmas songs……and they don’t have another parade for Christmas. It may be held on Thanksgiving Day, but really, you don’t see many turkeys marching down 7th Avenue. I think the funniest problem they had with a balloon was in 1957, when Popeye the Sailor’s hat filled with rain water which caused the balloon to sag or whatever and poured water all over the crowd. Maybe it wasn’t funny at the time…. This may seem over the top, but we have ANOTHER Santa Claus parade on November 25. This one is at night. Whooo! A smaller parade but almost better for the kids. Less noise, more lights. I like it! (St. Hubert Street). So there you have it. I’m only considering my three favorite cities here but Christmas is coming like it or not. And if you don’t like it……what’s the matter with you? OH! I missed the local parade in London (Can) this year! Drats! I love a parade. That's too bad Kara! Wow, the London parade was even earlier than here! Santa must like you best!